The team at Eparé created stainless steel tools to make your coffee-drinking experience better. 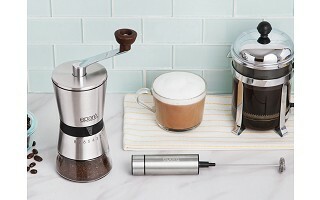 Their ceramic burr coffee grinder and handheld milk frother help you easily elevate any cup of coffee to a cafe-worthy drink. You might not know that coffee beans can be ground to different coarseness to suit different coffee makers (and tastes). The Precision Manual Coffee Grinder lets you dial in to the just-right grind with 15 settings, ranging from super fine to chunky. The grinder’s ceramic burr makes quick work of beans and it won’t dull or rust over time like a metal burr can. 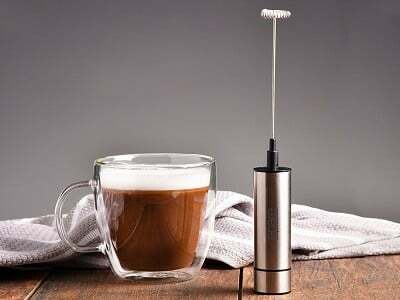 The milk frother is a surprisingly powerful tool that lets you whip up a latte or finish off coffee with frothy milk almost as fast as you can say “grande”. The whisk end pops off the battery base for easy cleaning. Both tools are well-made and impressed us with how well they worked. They are easy additions to your coffee-making routine that make any cup a bit more special. Are the milk frother components dishwasher safe? Yes, simply remove the whisk head from the base and wash in the dishwasher. Do not run the base through the dishwasher. 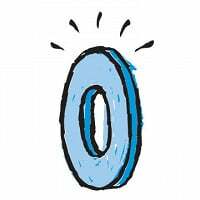 How much coffee does the manual coffee grinder hold? The easy load hopper holds 60 grams—or 2.11 ounces—of fresh, whole coffee beans. The team at Eparé created stainless steel tools to make your coffee-drinking experience better. 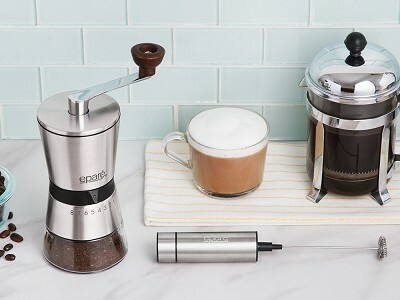 Their ceramic burr coffee grinder and handheld milk frother help you easily elevate any cup of coffee to a cafe-worthy drink. You might not know that coffee beans can be ground to different coarseness to suit different coffee makers (and tastes). 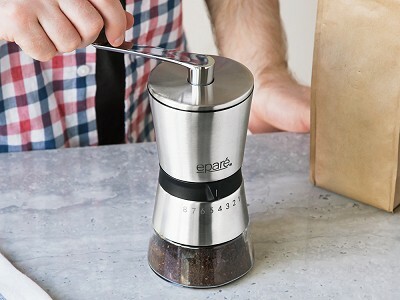 The Precision Manual Coffee Grinder lets you dial in to the just-right grind with 15 settings, ranging from super fine to chunky. The grinder’s ceramic burr makes quick work of beans and it won’t dull or rust over time like a metal burr can. The milk frother is a surprisingly powerful tool that lets you whip up a latte or finish off coffee with frothy milk almost as fast as you can say “grande”. The whisk end pops off the battery base for easy cleaning.